Emmanuel Rogers speaks to Sara Given, author of a satirical book, which came from a personal blog and facebook group – Parenting is Easy – subtitled – You’re just doing it wrong. We’ll also have music from The Platters, and conversation with former lead singer Sonny Turner. This is the first of several interviews with members of an all-star lineup in a concert coming up soon in Ontario, including Leon Hughes and his Coasters, Little Peggy, Barbara Lewis, Johnny Tillotson and Pat Boone. Emmanuel Rogers speaks with Dale Brown about his new novel – Iron Wolf – continuing the story of Brad McLanahan, now in the conflict in the Ukraine. We’ll also get music from The Drifters, and conversation with Charlie Thomas – with the group for their BIGGEST hits. 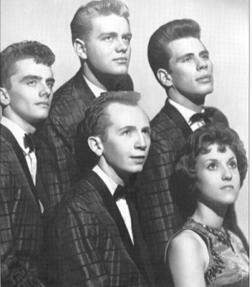 Charlie and the Drifters will be appearing with The Skyliners, and the Marcels in Upland in the very near future.